Sometimes a close game can be won with a great play at the buzzer. You might find one of these plays helpful with the post-season tournament coming up soon. Coach Izzo at Michigan State calls it "Wizard" (see video below). 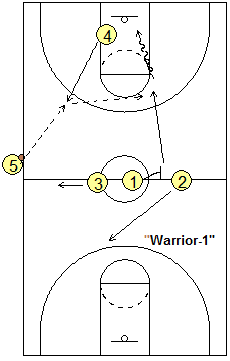 We actually won a game at the buzzer using this play a few years ago, getting a wide-open lay-up. O4 sets up at the ballside low block, hands on his/her hips, bent over, as though very fatigued. Then suddenly O4 flashes up to the 3-point arc to receive the inbounds pass, and looks for the cutter on the opposite arc-elbow area. 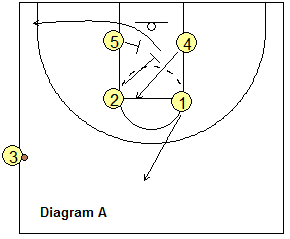 O1 screens for O2 and quickly slips the screen, and cuts hard for the pass from O4. 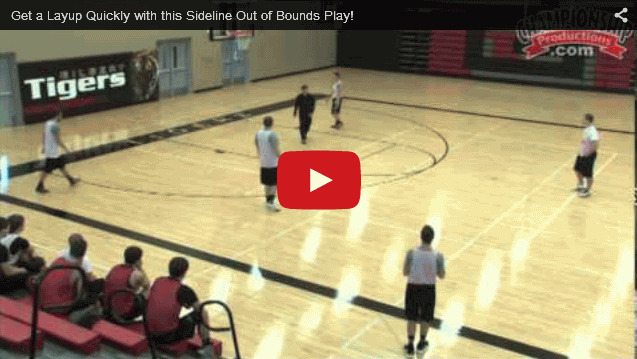 Here's a good play from Coach Fran Fraschilla's DVD "Baseline to Baseline Special Situations". Start in the box set seen in diagram A. O2 down-screens for O4. O5 screens for O2, and after screening for O4, O2 cuts to the corner. O1 cuts to the top. O4 cuts up to the free-throw line off O2's screen, then suddenly plants the pivot foot and cuts hard back to the hoop looking for a lob pass from O3 (two-handed overheard pass). 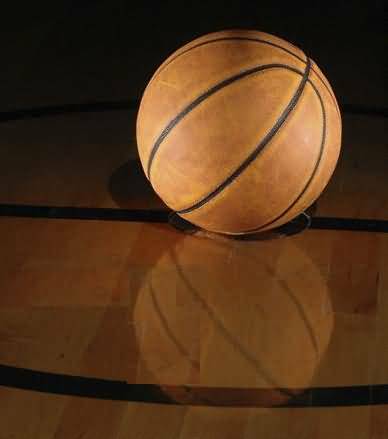 Notice that after screening for O2, O5 cuts up above the free-throw line, which clears out the paint for O4's back-cut. 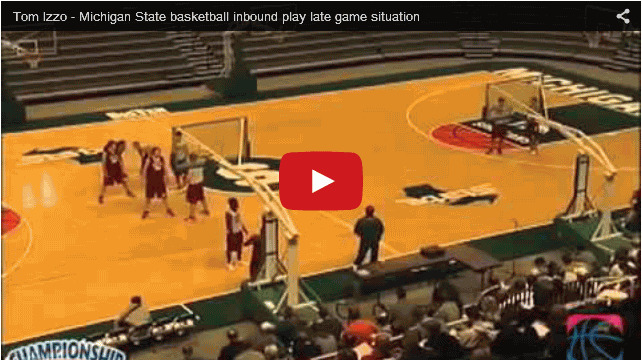 I love this full-court play for a 3-pointer with only a few seconds left. Our girls team scored on this at the end of the first half, and we won that game by one-point. 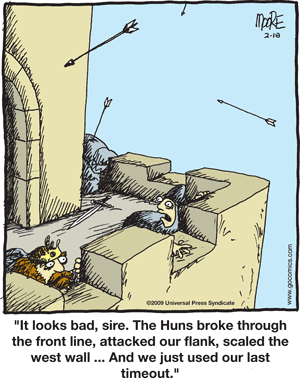 We start in our usual press break alignment, so the defense thinks the pass will go to O1, who is actually a decoy. On "go", O5 cuts hard to the half court line and receives the long pass. 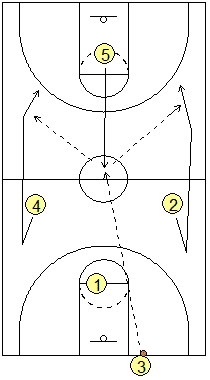 O2 and O4 take a couple steps toward the ball and then back-cut hard to the three-point arc on either side. O5 catches the ball, pivots and fires the pass to either O2 or O4, who gets the shot for the three-pointer. To run this play, you need more than 5 or 6 seconds left in the period (game). It is probably less risky than "Maryland" above and is better for getting a two-point shot (or a foul on the drive to the hoop). Get the ball to your best player... in this example, we give it to our point guard O1. 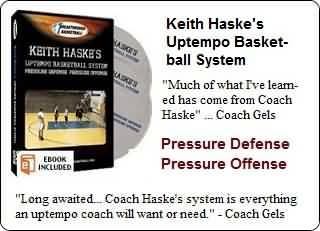 This play will put some pressure on the defense, who is trying not to foul, and yet trying to stop your best player. O1 is the in-bounder. 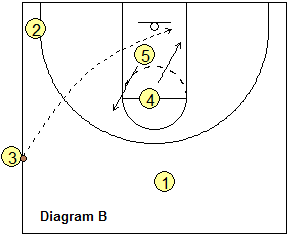 O3 and O2 break in opposite directions for the in-bounds pass. 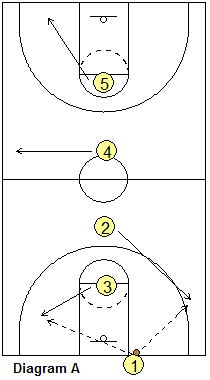 O1 passes to either O2 or O3, sprints through and gets the return pass from O2 or O3, and speed-dribbles up the floor trying to find a seam and must take that last shot - there usually won't be time for a pass. O1 must have a sense of the time to get the shot off in time. 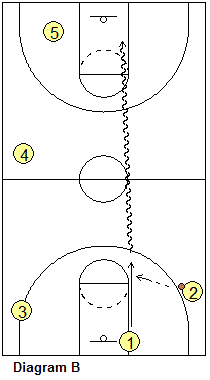 If O1 is denied, the player with the ball (O3 or O2) will have to speed-dribble and make the play. O4 splits opposite and runs wide up the sidelines. O5 goes deep, and could get the pass from O1 (if there is enough time).